Neutrik Plugs (EN) | PRO MUSIC, s.r.o. Neutrik nabízí celou řadu Jack konektorů různých velikostí. Vyznačují se snadnou montáží použitím a spolehlivostí. Svou robustností a celokovovým povrchem dosahují dlouhé životnosti. The silentPLUG automatically mutes (shorts) an instrument (guitar) cable to avoid pops and squeals when changing the instrument (guitar) under load. The integrated silent switch (pat. pending) is based on REED-technology and guarantees a lifetime beyond 10 '000 mating cycles. The new PX silentPLUG features a rugged metal shell enhanced with a rubber cushion overlay for improved shock protection. Fancy, noble, valuable, attractive – the crystalCON connectors made with Swarovski crystals are eye catchers. Professional phone plugs with robust metal shell and chuck type strain relief. 2 pole 1/4" professional phone plug, black metal housing, Nickel contacts. The characteristic sound of a guitar is not only influenced by the guitar (strings, pickups, body) alone but also by the attached instrument cable and the guitar amp. Neutrik’s timbrePLUG provides the possibility to change the timbre of your guitar sound. 2 pole 1/4'' professional phone plug, up to 10 mm cable O.D. 3 pole 1/4'' professional phone plug, up to 10 mm cable O.D. The ultimatePLUG combines the functions of the silentPLUG and timbrePLUG in one product. Professional phone plugs in B-Gauge and MIL type design according B-Gauge standard BPO316 and MIL standard MIL-P-642/*. They are featuring similar construction as the standard Neutrik phone plugs with chuck type strain relief and slimline metal barrel to meet the high requirements for military communication equipments. These plugs are not compatible with standard 1/4" jacks (acc. EIA RS453) and patch panels. 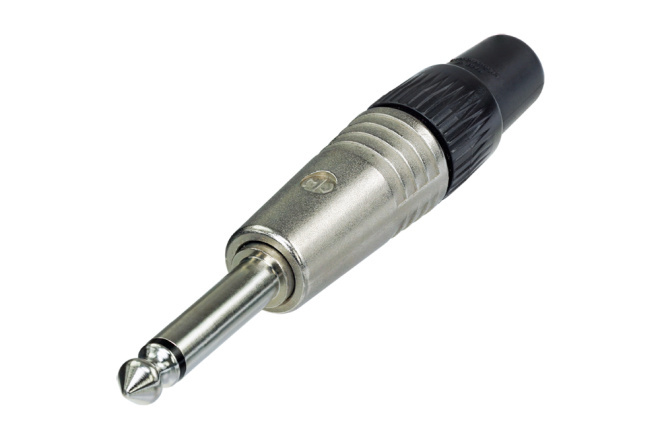 4.4 mm (0.173") tiny telefone plug bantam type featuring 3 conductors and HEX crimp cable strain relief. These plugs have solder contacts for Tip and Ring and crimp termination for the Sleeve contact, as well as red or black plastic handles for quick assembly. Ideal use with TT patch panels. The only right-angled metal bodied 3.5 mm jack plug with chuck type strain relief for secure cable retention. It accepts cables from 2.0 to 4.5 mm.